The Hamilton Beach 80-20 disher has a 1.84-ounce capacity and a yellow handle made of high-impact plastic. Its bowl, thumb lever, and spring are made of stainless steel for durability, and its spring action is simple to use and sturdy. To reduce hand and arm fatigue, the handle has an ergonomic grip. This disher has a Pan Rest™ feature that lets the disher rest on the side of food pans with built-in notches. 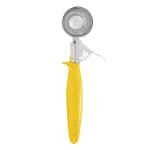 Its color-coded handle designates it as a size 20 utensil, and its capacity is molded into the handle for quick identification. Visit our dishers buyers' guide for more information about this utensil.